Summer turning into autumn or fall is always a long, slow-changing process that takes a lot of getting used to, with the long summer nights now drawing to a close, the change in weather is quite significant. What is toughest for us to get used to is the drop in temperature, although you most always are thinking that its possibly too warm for a jumper and too nippy for a t-shirt. Therefore, a long sleeve shirt is what you would be looking for, as it has the same material as a regular polo and is not too heavy or light for that time of season. Colours of this polo come in a variety of different outlooks, including: Black, Forest Green, Maroon, True Navy, True Red, True Royal and White Sizes of this polo range from XS-4XL. 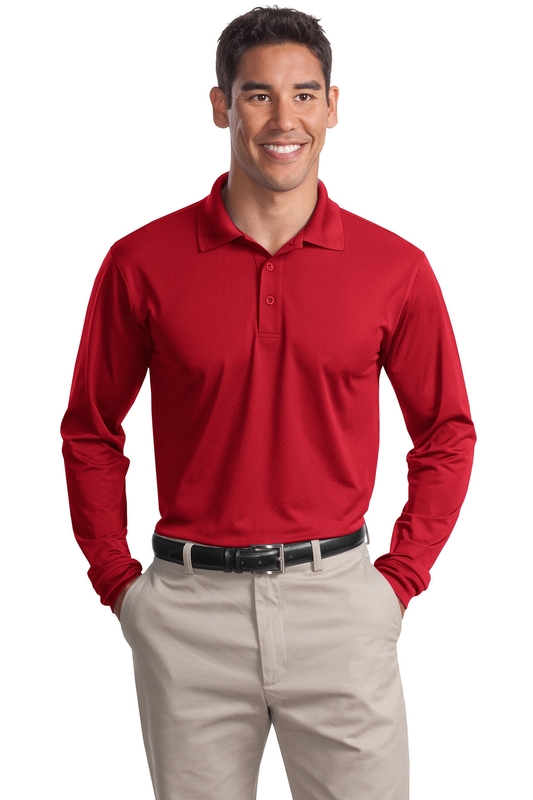 The long sleeve micropique sport-wick polo weighs 3.8 ounces and is made from 100% polyester tricot. A major feature of this polo is how it is snag resistant. A snag is created when a sharp or rough object pulls, plucks, scratches, or drags a group of fibres, yarn, or a yarn segment from its normal pattern. It is a big feature as the quality polo won’t be affected by any unforeseen distress to the material. It is double-needle stitched which gives it a thick layer of material, again making it very strong. Another feature is its tag-free label with a taped neck, this ensures maximum comfort for you. The flat knit collar and cuffs give a sense of professionalism and style to the polo as the collar tucks nicely into the rest of the design. The 3 button placket give an extended length to the polo, breaking away from the traditional 2 placket polo and offering you more of a chance to breath effectively by adding a third button, so more air can circulate around your chest area after a long training session or run. The dyed-to-match rubber buttons give a sporty vibe to the polo as they are very useful when changing your gear quickly. They are also lighter than wooden buttons, so if your button was to swipe off an opponent, it is unlikely any tear will be caused. The set in sleeves that include side vents ensure there won’t be any trapped air around your body while carrying out a task or work. There will be plenty of room from the vents, in terms that congestion won’t be an issue.